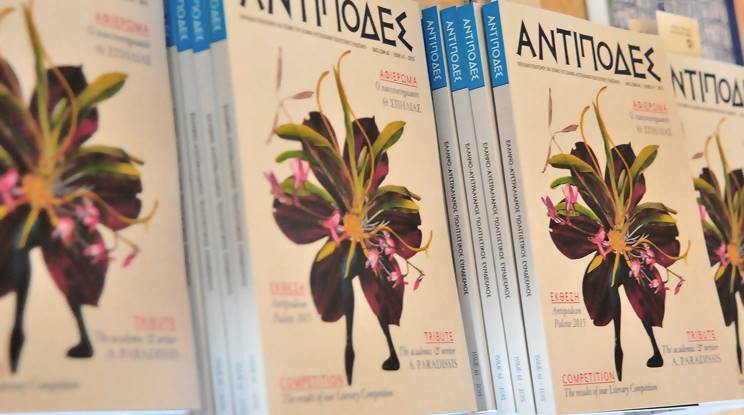 The 65th issue of the literary periodical Antipodes will be launched οn October, 2019. This year the periodical is celebrating its 46th year of continuous circulation. The issue will pay tribute to the Greek-Australian artists of our community as well as a celebratory section on the 50 years since the establishment of the League in 1969/1970. As usual, this issue will publish works submitted by our members or non-members such as poems, short stories, studies, essays, book reviews and οther literary works, in Greek and English and the Visual Arts. Works to be submitted for publication must be original works that have not been published or promoted in another publication. Literary works should be no longer than the limits prescribed as follows: Poems: 100 verses (lines), short stories and essays; 2000 words, meditations: 800 words, studies: 2000 words, book reviews and other reviews (exhibitions, music, plays, films): 1000 words. The deadline for submitting contributions is Friday 12th July, 2019. Works that exceed the specified size limits will be rejected, without involving the Editorial Committee.